We utilize various machines that allow us to strip discrete wires and small, multi-conductor cables in short cycle times and also provide us with infinite settings for conductor diameters. Our equipment stripping and pull-off lengths greatly increase our productivity. 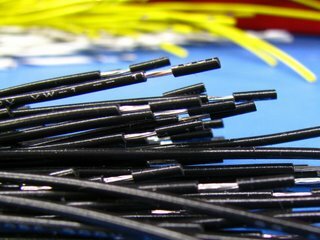 Furthermore, our technologically advanced equipment increases our processing possibilities, allowing us to process various wires and cables, such as discrete wires, multi-conductor cables, and flat ribbon cables. 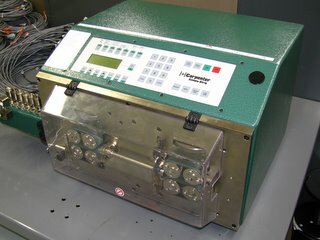 We use various testing equipment to 100% quality test cables and wires that have been stripped. We are able to find defective or miswired cables instantly before equipment is damaged or time is wasted. Our testers have a graphic wiring display that visually pinpoints wiring errors and that will pass/fail the wire harness expeditiously. We are able to find opens, shorts, miswires, and intermittent connections, and we also can check for contact isolation and resistance thresholds.